Designed for the Soviet Lunar Space program, the Soyuz spacecraft is still in use today bringing astronauts, cosmonauts, and other guests to the international space station. The Soyuz I printed would have been in flight during the time of the Gemini and Apollo US missions. 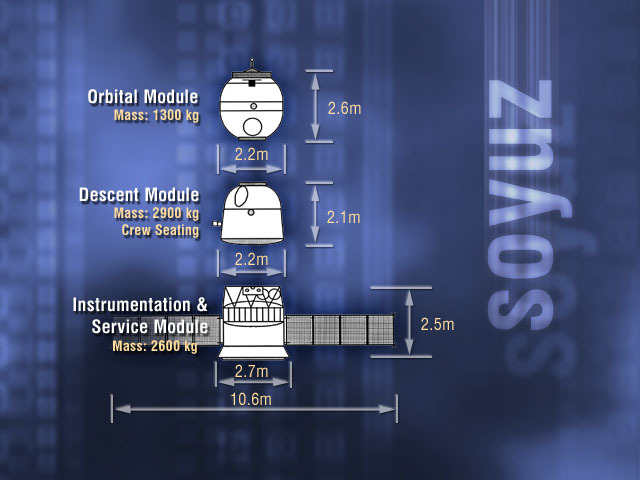 You can read more about the Soviet manned lunar_program here.The space craft is made up of three part as shown in the diagram below. Printing this was pretty straight forward but I did and supports for the solar panels and the area around docking mechanism needed a bit of filling with UV glue. As to painting, it seems like there may have been two colors of green paint used on the Soyuz. I went with the darker of two and used a plastic spray paint. For the rest of the painted details, I used paint markers and the markings are done with water slide decal. One thing of note, I did print to a white decal as the clear decal did not show up well with the dark paint.